Sporting a clean, modern look that strays from the majority of the Dragonfish stable that operate as sister sites, Welcome Bingo is a gaming site that offers a pleasant selection of bingo opportunities, games and plenty of bonus codes to go around. 100% SIGN UP BONUSNew Customer Offer. T&Cs Apply. 18+. Please Gamble Responsibly. At Welcome Bingo you can enjoy a diverse range of different games and also try out their latest promotional offers. Certainly, the look of the site appears to be inspired by formatting and visuals often employed at larger sites – and with the bingo welcome bonus heavily signposted – along with plenty of information on the various games and features available on-site, there’s plenty here to inspire new customers to jump in and have a look. Check out our Hunky Bingo review to see another brand from the same software providers. On first glance, the website doesn’t have any of the hallmarks of the Dragonfish standard – which, in a few ways, can be a good thing. The platform is extremely reliable and places user experience at its heart – but with so many smaller sites using the same templating and games libraries across the web, seeing the same features can get a little tiring. Beyond the look and feel of the site, however, are a heap of intriguing deals and more than enough reason to grab at that opening promo code from our Welcome Bingo review. The bingo welcome offers here come in two flavours for April 2019 – free bonus credit, and cash matching. While the £10 free bonus deal is wide open to any new customers who sign up, you can take your pick from one of two matching scenarios available should you wish to make a deposit. There are two promotion codes, in short – and you can either opt for 300% in cash matching for bingo, or 100% for casino games. This covers slots, too – and while there may be a standalone Welcome Slots site, too, the bingo site does offer a nice collection of popular slot games for you to get stuck into. There’s additional cash matching available too, later down the line – meaning that if you choose to stick around and put more money in, you’ll benefit from more Welcome Bingo bonus codes to pick from – again, offering matched deals on bingo and casino games. There are plenty of regular deals and themed promotions, too – particularly when it comes to jackpot prizes and cashback opportunities. In fact, if you deposit between £100 and £500, you can use a bonus code to grab 10% back – but do make sure you read through any and all terms that may arise! The website again goes against the grain set by Dragonfish elsewhere online, particularly as it offers up a very nice slice of bingo action that isn’t limited to one or two rooms. The rooms do seem to be fairly busy – at least when we visited – and they each have interesting themes such as ‘90s Extreme’ and ‘Woodstock’. This, at the very least, goes against the Dragonfish norm set by smaller sites over the years. There’s a free bingo lounge, too, which will be of interest to new customers trying to settle in and for existing customers simply up for saving a few pennies. Everybody wins! Other reasons to grab a Welcome Bingo login lie in the fairly comprehensive slots experience. Taking a leaf out of its sister site, Welcome Slots, the site offers plenty of big name games such as Siberian Storm and Wolf Run alongside brands such as Guns N Roses and Superman. This is a nice touch to add onto the back of the bingo experience – and, again, it does rather go against what we’ve come to expect from Dragonfish bingo catalogues over the years. Add in a few nice table games and scratch cards and you have a generally nice bingo site that at least attempts to cater to other audiences. The theme and look of the site may be a little bland – and there may not be that much to go on in terms of casino games here – but there is at least some attention to detail. As stated, the Welcome Bingo site operates on the popular Dragonfish engine. This is a platform, which is widely used by small to medium sites across the web, largely thanks to its flexible software and its focus on customer care. It has also come packaged with a generally varied games catalogue over the years, though many of these games are now showing their age. It’s therefore a good sign that this site has chosen to throw in a few more refreshing names alongside their unique bonus codes to try and pull in new customers. For the most part, the software works well here – it’s solid, efficient and works well across all devices – the only bugbear for us lies in the rather bland design. While there has been focus on a sleek, minimalistic look here in using Dragonfish to its full potential, we still feel that more could have been done to flesh out the site’s identity. That being said, it really does make the most of the best that Dragonfish has to offer – and we shouldn’t sniff at that. Like other Dragonfish sites such as the City Bingo site, there are plenty of promo codes and regular chances to win free bonus credit. To withdraw, you will need to make sure that you have deposited at least £5 – if you are taking up one of the site’s bingo welcome offers, along with cash matching, this shouldn’t be too difficult. You’ll need to have at least £20 in your cashpot to take away, and you will generally see your winnings back with you within 7 business days. That being said, processing is generally much quicker. The wagering requirements here do vary, and you will do well to look into the exact terms for each promo code or bonus code you take on. For bingo, you’ll need to play back 6x your bonus and deposit – and it’s 80x for everything else. The terms for bingo are quite competitive – and while many slots and casino players could easily play through 80x without issue, there are many other sites offering much more reasonable deals. As part of the Dragonfish standard, it is nice to see that the site continues their trend in that is easily accessible from a number of devices. You’re able to play all of your favourite games and bingo rooms from desktop to mobile without issue – everything here is optimised and standardised. Take a look at our Bingo Besties review to see another great site which has mobile features. There may not be an official app on the scene at this time, however, what’s here is a mobile platform that does offer a great deal of flexibility and the same amount of charm as its desktop counterpart. Simply browse directly to the main site from the browser and device of your choice and use your Welcome Bingo login to gain access to games, banking options and more besides. There’s plenty to see and do for portable players, too – and you won’t be missing out on any big promo codes simply by choosing to move away from the main site. We don’t think you necessarily need an app to get mobile play right – and there’s thankfully plenty of functionality here. 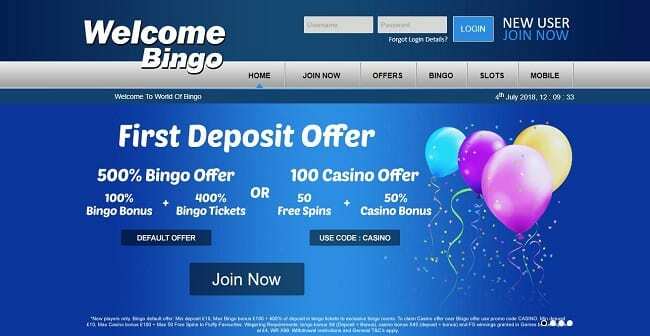 The site may not have been up and running for long, but it is already setting a clear example – nice games, smooth functionality and plenty of big Welcome Bingo bonus offers will keep you coming back for more. Despite a fairly bland design, it does well to keep ahead of sister sites – though we do advise that you exercise caution when it comes to taking on any deals or promo codes – particularly as the slots and casino matching deals require you to play almost double back what many leading mobile casinos request. If you enjoyed our Welcome Bingo review for April 2019, be sure to try it out for yourself.